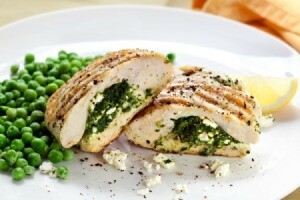 A simple main entree that you can use other cheese to substitute for feta when stuffing your chicken breasts. This page is about feta stuffed chicken breasts. The cheese adds a rich taste and moistens the breast in this simple, quick main dish. Serve with a green salad and hard rolls for an easy meal. Line an ovenproof dish or cookie pan with aluminum foil for easy cleanup, brush with oil. Fillet each breast so it is one large flat piece. Spread the 1 tea. of mayo on inside of breast, sprinkle feta cheese on mayonnaise how much you use is really up to you, substitute whatever kind of cheese you like. Sprinkle lightly with salt and pepper, remember the feta cheese is very salty. Start at the end without skin and roll up. Secure with the toothpicks using enough to make sure the cheese cannot melt out. Brush rolled breasts with oil then roll in your flour and cracker crumb mix. I like to season the outside a little also with salt and pepper. Drizzle with just enough oil or butter or spray with oil to help brown. Bake until juice runs clear at 350 degrees F., about 1 hour uncovered. Source: A friend served something like this and I loved it. She got hers from Taste of Home magazine, she thought.